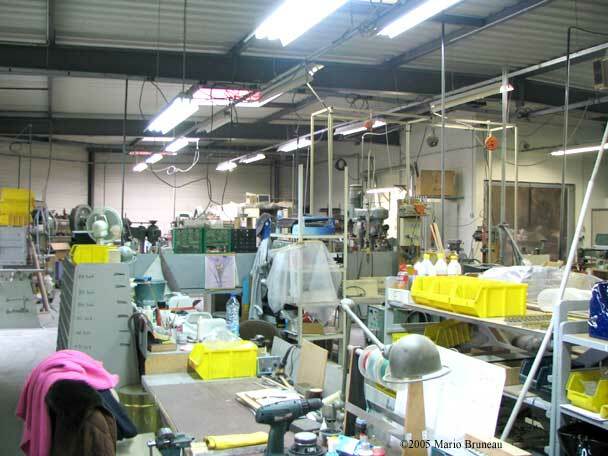 In November 2005 I spent 23 days visiting accordion factories in France and Italy. The most important thing I had in mind was to totally enjoy my vacation trip with my wife and at the same time explore some accordion factories to feed my Accordion MultiMedia Conference. Well I can assure you both goals where totally satisfied. I’ve met a bunch of nice smiling and happy persons and learned a lot at the same time. Since I play mostly musette style and that it is understood that it’s very difficult if not impossible to imitate the bright sound of the typical French musette chromatic button accordion (CBA) with a piano accordion (PA), I was thus looking for a piano accordion that could get closest to the CBA musette sound. So I took several sound samples of the accordions that I tried. I wanted to find out about the harmonic content of different piano accordions’ single clarinet reed since the more harmonic a single reed has, the best it will be for reproducing a musette sound. The musette sound is produced with a minimum of two clarinet reeds tuned with a slight difference. This results in a richer sound with added harmonics but if one starts with richer or brighter single reeds, it is obvious the sound will be even richer with two coupled out-of-tune reeds. My experiment is not a competition nor do the results represent the best accordion since it’s my own personal taste that is biased by my preference of the musette sound. Personal taste differ and one can prefer the mellower sound of the cassoto and dislike the clear and bright musette open sound. All the accordions tested on this list are excellent instruments and they are all musette models since it is my preferred sound. It is by no mean scientifically rigorous but it confirmed what my ears heard. I Used my Canon S1 IS digital camera to record an A440 middle reed taking care to always pull the bellows (the sound is different when pulling or pushing the bellows, did you notice that?). My digital camera is recording at 22KHz sampling rate into 16 bits so my readings got up to only 11kHertz. This is enough if one consider that the 16th harmonic of A440Hz is at 7040Hertz (7kHz) I tried to be consistent as to the distance and the force I use to take my samples but took no chance. 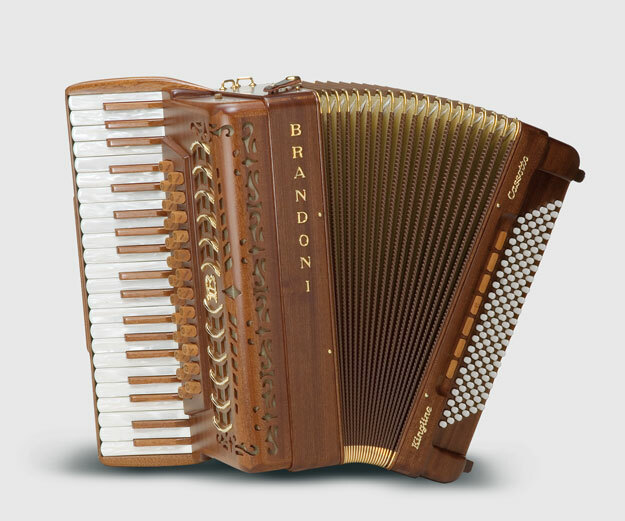 For that, I had my own Brandoni piano accordion at hand. To compensate for different acoustic environments I would always sample the other accordion AND my own Brandoni to sort of analyze-compare the acoustic response of the different rooms or showrooms I was sampling in by analyzing the different responses of my Brandoni. I took only 1sec sample from each accordion recording and processed it with SoundForge software program. From the SoundForge program I rolled off from 320Hz downward and then make sure all the samples where at the same dB level. Only then I would pass them through a Spectrum Analyser (Fourrier Analysis) which would show me the harmonic content as well as their amplitude (importance). The spectrograph is used to represent a graphic image of a sound. The frequencies are indicated at the bottom and in the black window above, the yellow bands represent the intensity of the frequencies. After I imported the graph in PhotoShop and draw a curve of the harmonic content with a different color for each accordion. Then by super-imposing the graphs, I would see which accordions had the most harmonics. I will show you the results at the end of this article. I rented a car for the whole trip (23 days) at Paris Airport and spent 4 days in Paris. After I went to visit my good friend, the CBA musette player Daniel Colin who live not far from Paris. Daniel Colin plays on a French Maugein accordion. Then I went to Tulle, a little town right in the centre of France in the Corrèze Department where Maugein the French accordion factory is. M. René Lachaize a gentlemen, was nice with my wife and I. He invited us for lunch at his friend’s restaurant. After a good meal, he made me visit the Maugein factory. 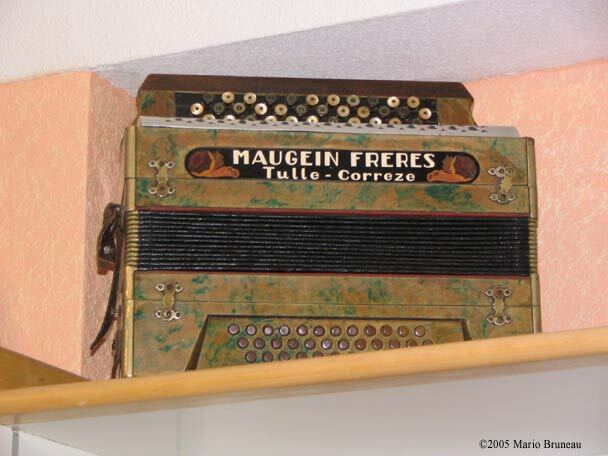 Maugein is one of the few accordion makers able to produce an (almost) entire accordion. 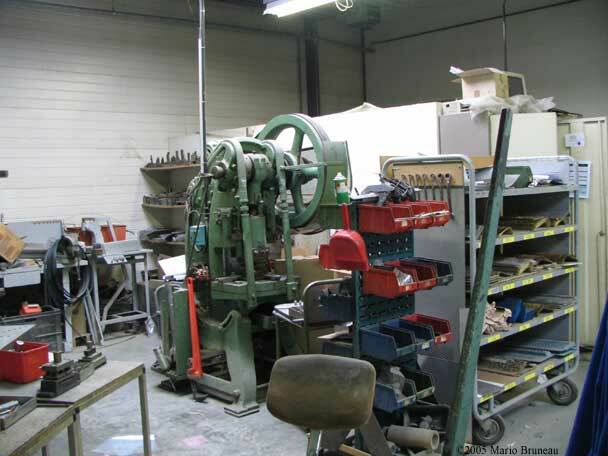 A lot of computerized machines designed especially for accordion making. I was very impressed. 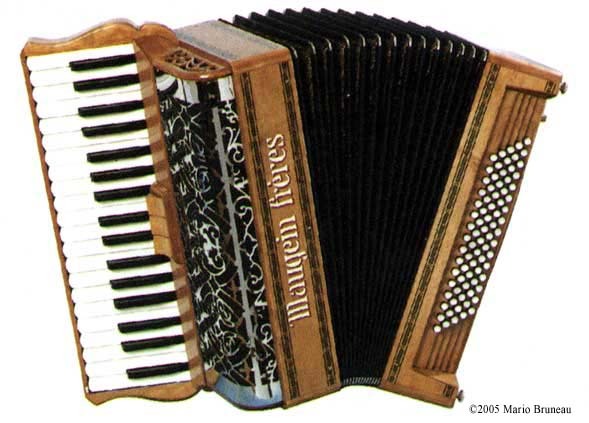 Maugein produces one of the best looking natural wood finish piano accordion. 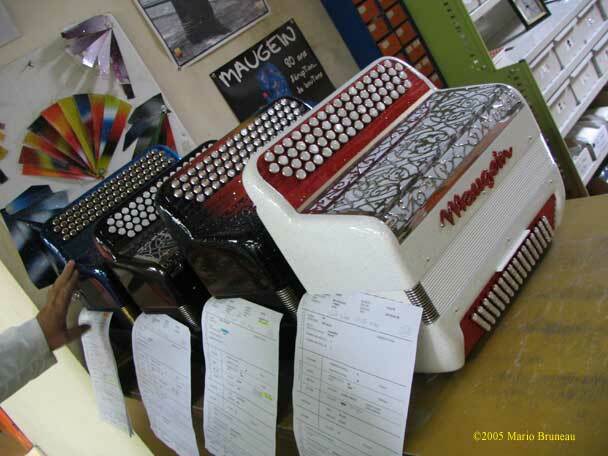 Efforts are made at the Maugein factory to best explain the different aspects of accordion making to visitors. M. Lachèze himself takes care of the visitors. There was a nice wood carved representation of a reed to show the profile of a reed invisible to the bare eyes. M. Lachèze introduced me to Laurence Lamy, the director of the new Musé de l’accordéon in Tulle. Imagine, they have taken a complete accordion shop from Paris (Martin Cayla) took apart the interior as well as the exterior’s façade and reproduced it inside the museum. It was a privilege for me to visit the museum in a temporary building because the museum is not ready yet. They will build an entire building made exclusively for the museum with controlled temperature and humidity. And now for those of you who plan to visit the Maugein factory, I have a secret to share. 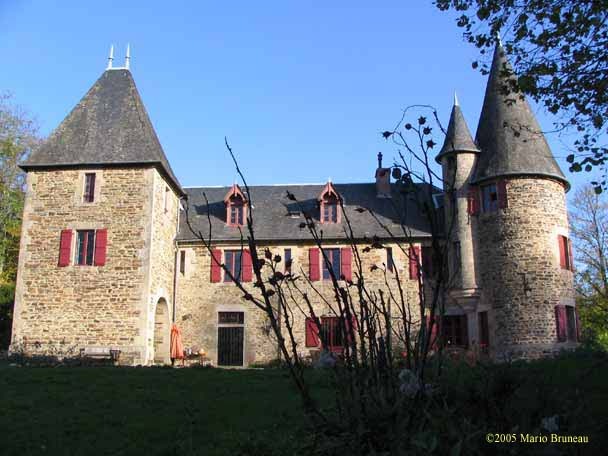 For less than 60Euros per night for two, you will live in a suite of Château du Domaine Bellefond. If you have a car, you don’t want to miss that. Its only 20Km from Tulle right between LaGraulière and St-Clément. What a sight! 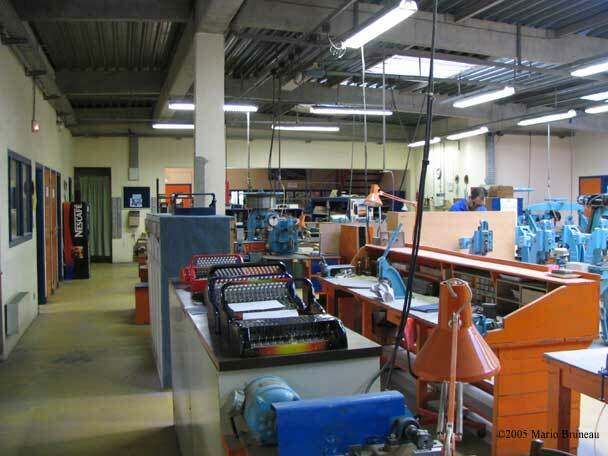 Then heading east, I went to Lyon where the Cavagnolo French factory is. Fredo Boss singing like crazy! After we headed south towards Nimes to visit some friends musicians. 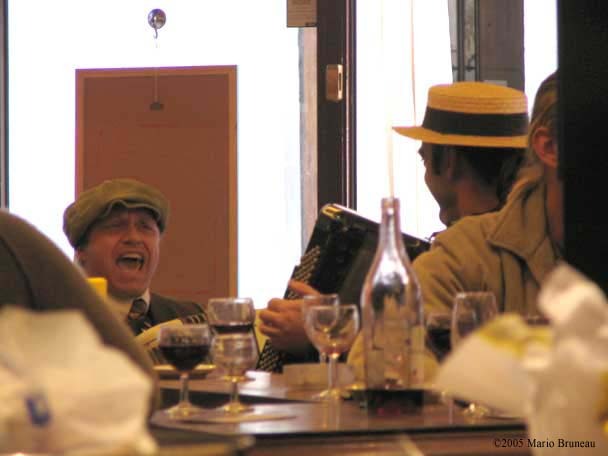 It was the 17th of November and in France it’s the Beaujolais Nouveau day and some accordion players can be found in different venues. I saw an accordion duo in a café. One of them I knew, his name is Fredo Boss. He’s a French guy playing a piano accordion would you believe! He sings some very typical old French musette type songs. Right in front of our Hotel was a nice restaurant which had a pianist and accordionist programmed for the Beaujolais Nouveau night. I went for super and I had a ball jamming with this old French musette player “Momo”. He also play nice Django type manouche guitar. We had so much fun playing musette and manouche! On our way to Castelfidardo, we stopped at nice villages nearby the Mediterranean Sea like Aix-En-Provence, Nice, Menton, etc. Castelfidardo is 10Km inland from the Adriatic Sea. Boy never was I to miss that! So we took a Hotel room at Sirolo Hotel. Sirolo is right on the Adriatic Sea. What a picture! The best gnocchi in the world! 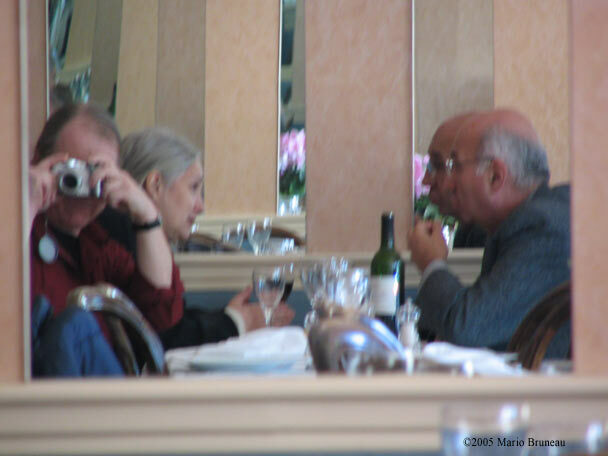 Next day, the first thing to do was to follow Ventura’s advice and take a lunch at Dionea’s Trattoria. What a feast! We went back 4 times! The first accordion I tried and sampled was at an accordion builder’s showroom that had threaten me of legal pursuit if I didn’t remove his company name, so I did . I guess he wasn’t satisfied with my next sentence: nice and open sound but not more. Their showroom is away from the factory so I didn’t visit their factory. 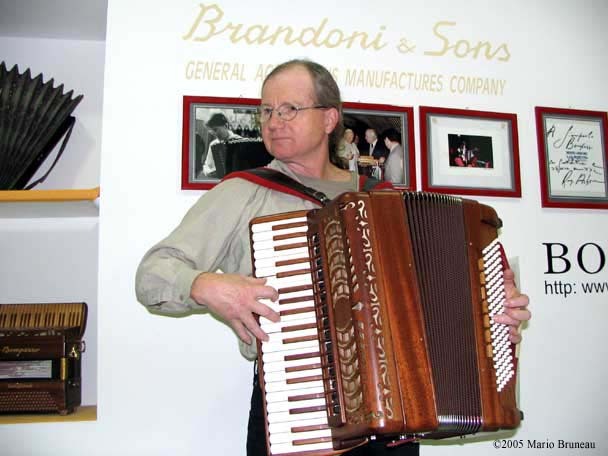 Since 12 years I’ve bought my Brandoni accordion, I always enjoyed its sound and was grateful to Mini and Romolo from the Montreal accordion shop “Les Accordéons Excelsior” now “Accordéons Excellence” to find it for me. So I was curious and figured it was a good idea to visit the Brandoni factory. It is now run by the Bompezzo family. M. Bompezzo senior first came to my wife and me but he couldn’t speak a word in English neither could I speak Italian for the same manner so he phoned his son Giampaolo to rescue. Giampaolo could speak a little English and his wife even more so we managed to communicate. I showed them my Brandoni and they liked the smooth musette tuning I did on it. I tried other black Brandoni boxes and liked them too. But their natural wood finished boxes where great. Full sound and a big dynamic. The bellows opened far away without resistance. I felt at home playing this box. Was it because I’m used to play it? I don’t think so. It’s probably due to the nice idea to put only the bassoun and the picolo inside the cassoto leaving the 3 clarinets outside the cassoto so you don’t sacrifice the real open musette sound. The one I tried was not completed yet with the right hand registers still needed to be installed. The celluloid has been abandoned! There is a tendency in Castelfidardo to produce more and more natural wood finished accordions which I think is a good thing. One of the first to produce nice wooden finished accordion as I recall was Fisitalia but now you see more and more wooden accordions made in Castelfidardo. 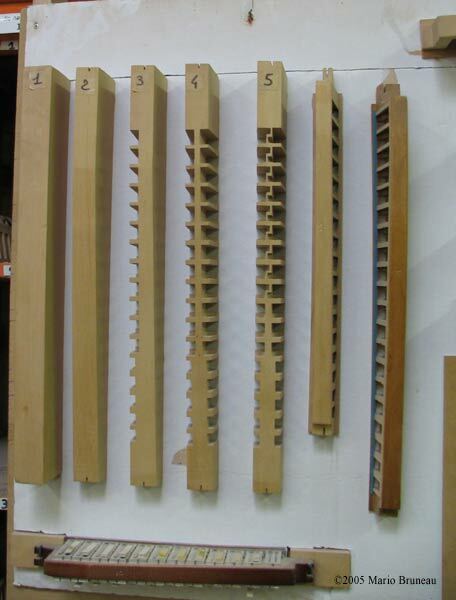 I know some beginners would choose the diatonic model over the piano model because it was in natural wood finish and that they didn’t like the “artificial” celluloid finish on the piano accordions. But now they have the choice. 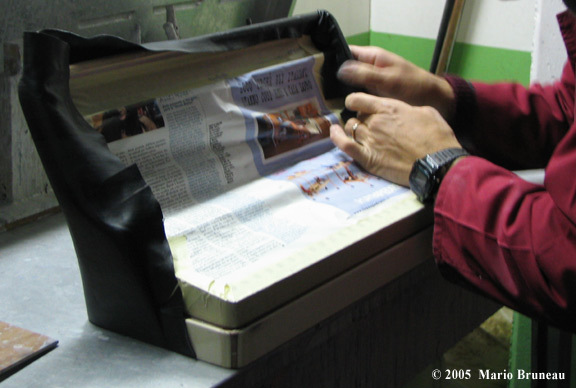 Talking about celluloid, the tendency is to substitute varnish to this old product. 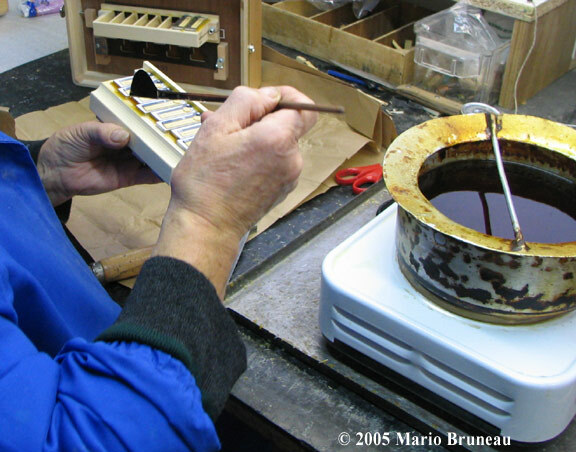 Celluloid is very dangerous for the health of the accordion factories’ employees. 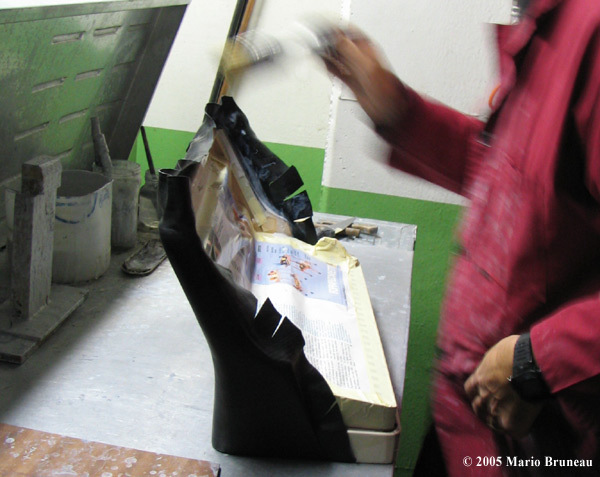 Like M. René Lachaize from the Maugein factory says, “with the development of new technologies in producing good varnish, one doesn’t need celluloid anymore”. I think he’s right plus, it’s bad for the environment. Here are two photos taken at SEM’s factory of a worker dying soaking the celluloid in acetone to then fit it around the accordion’s body. 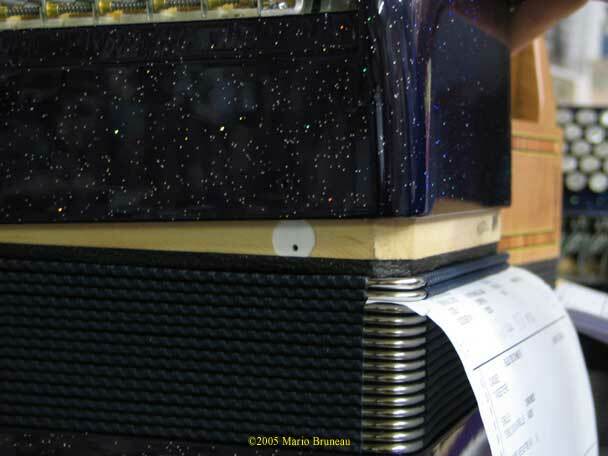 Note: celluloid was invented in 1869 by Hyatt but was used on accordions only 57 years later in 1926 by Astolfo Danieli! 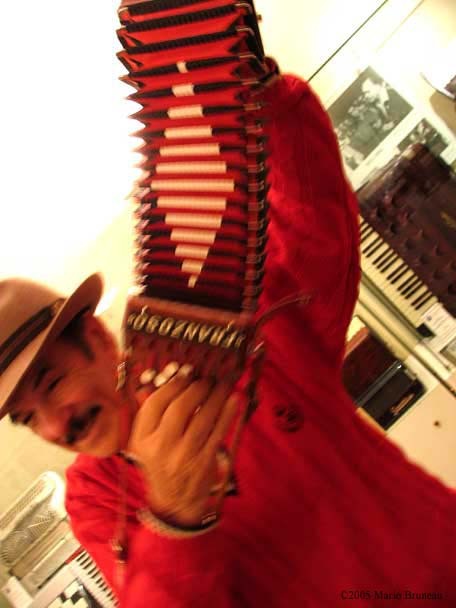 Playing a lot of musette tunes, Giampaolo Bompezzo then showed me a “not so good-looking” accordion. WoW! The musette sound coming out from this box. I was completely impressed. 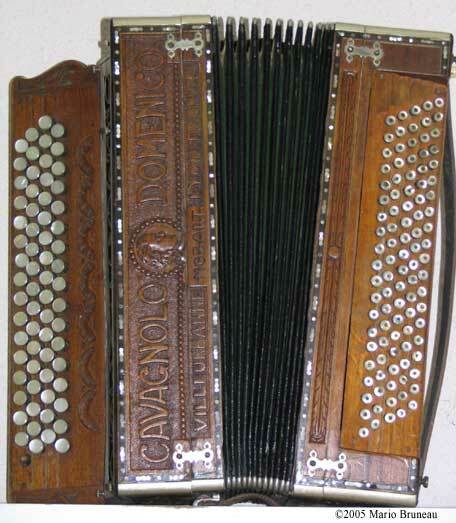 It was an accordion sold by Bompezzo for a manufacturer in Stradella. The name on it is byMarco Stradella. Well it seems they liked my playing at Bompezzo-Brandoni because they hired me to demonstrate their accordions in their boot at Frankfurt MusikMesse. So I’ll be heading towards Germany late March 2006 and promised myself to go back to Castelfidardo afterward. 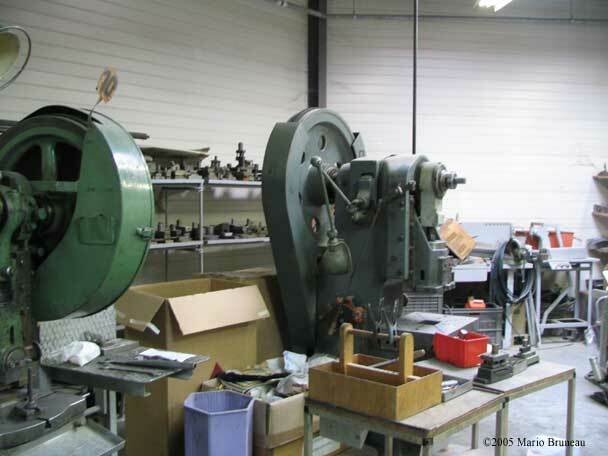 The next day, I visited the Borsini Factory. Nice and big shop but didn’t try any accordions. Then I went to the Castelfidardo Accordion Museum. I took at least 300 pictures in there! So many things to see. Met a good Italian character there who looked after the museum. His name is Antonio Franzoso “François” for the intimates. We had fun communicating musically. At the Museum, Antonio insisted I try a Zerro-Sette. 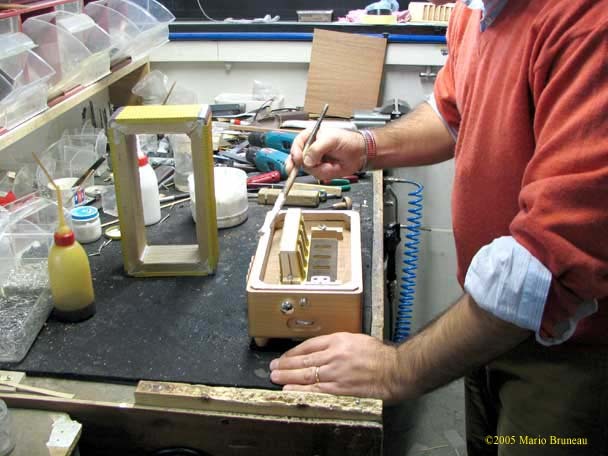 It was a tone-chamber model and boy did I have fun playing this box. One of the best in Casteldfidardo. Didn’t have the chance to sample it thought. Went to Menghini now named Suoni (Paolo Soprani, Scandalli, SEM). Tried them and frankly was not impressed at all. The bellows where hard to open and didn’t fully open. The sound was like any anonymous Italian made accordion made years ago in Castelfidardo (see notes later for my thoughts in Castelfidardo’s evolution). Nice people there. Their shop is huge! They must produce a lot of accordions there. THIS ACCORDION CAN REALLY PLAY! 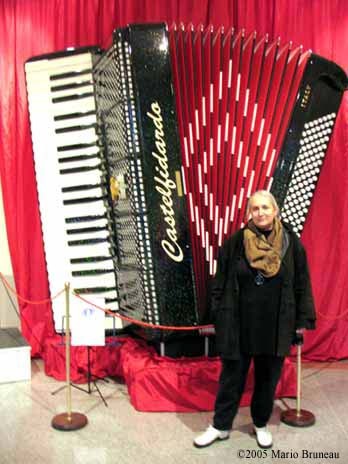 To finish and like anybody else, we went to see the giant accordion at the Paolo Soprani Museum. 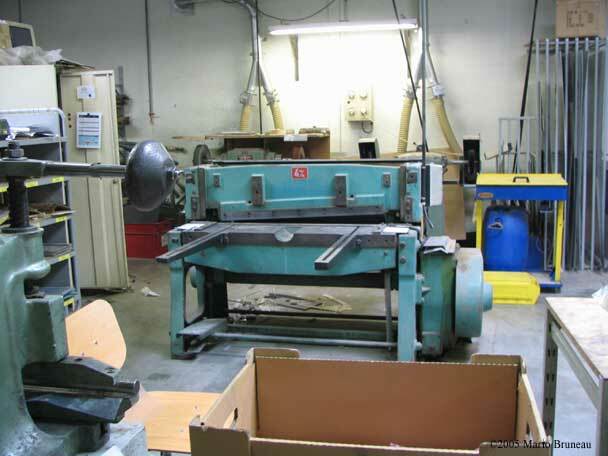 The yellow curve labeled Brandoni M is my Brandoni sampled at the Maugein factory. 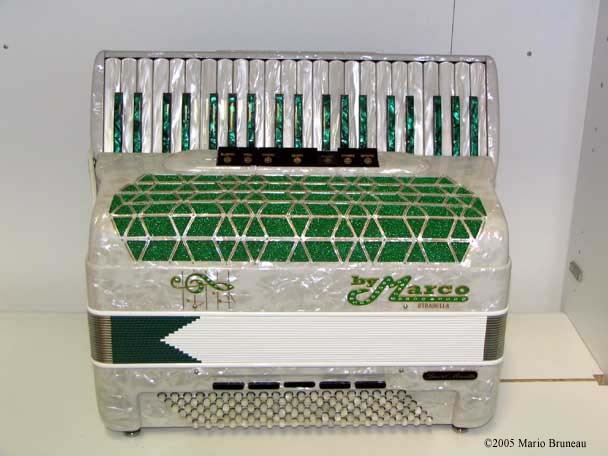 The green curve labeled By Marco is the byMarco from Stradella accordion sampled at Bompezzo-Brandoni factory. The pink curve labeled Maugein is the Maugein sampled at the Maugein factory. The violet curve labeled Cavagnolo is the Cavagnolo sampled at the Cavagnolo factory. The red curve labeled Brandoni A is my Brandoni sampled at the Anonymous manufacturer’s Showroom. 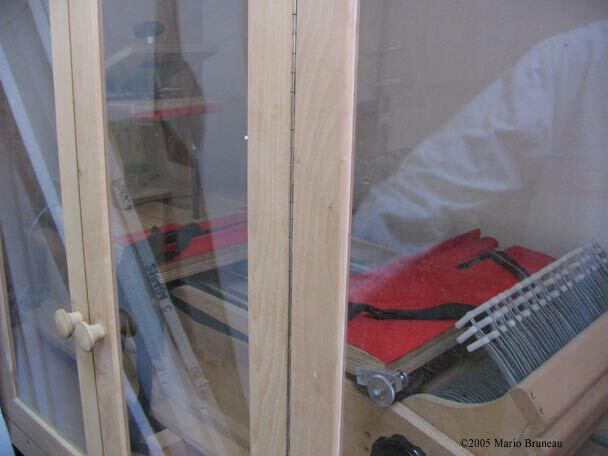 The blue curve labeled Anonyme is the accordion sampled at the manufacturer’s Showroom who don’t want to be published. The numbers before the labels represents the order of the winners (sort to speak), 1 being the best. As you can see, the Cavagnolo seems to have the most harmonic content with byMarco a good second but with a different type of harmonic content. Those two where the ones my ears pick. Notice the difference between the red curve representing my Brandoni recorded at the Anonymous factory’s showroom and the blue curve representing the anonymous accordion recording. 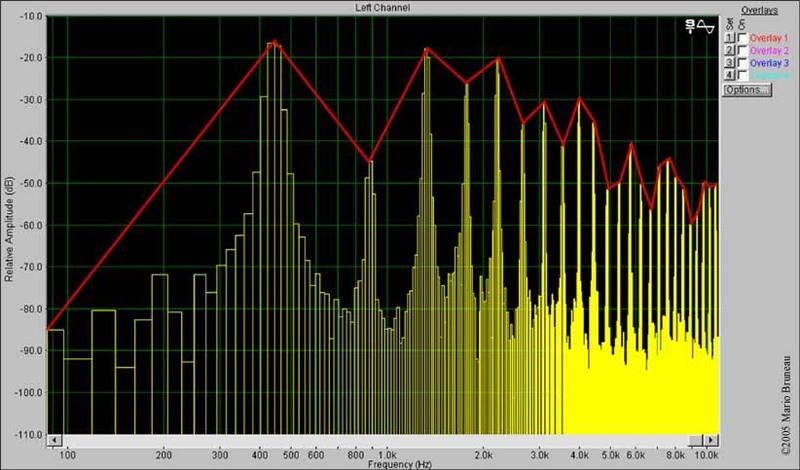 The anonymous has a drop in the 4kHz region which is a good thing since this is the region human ear is most sensitive to and accounts for the “screaming” and aggressive quality of the accordion sound. 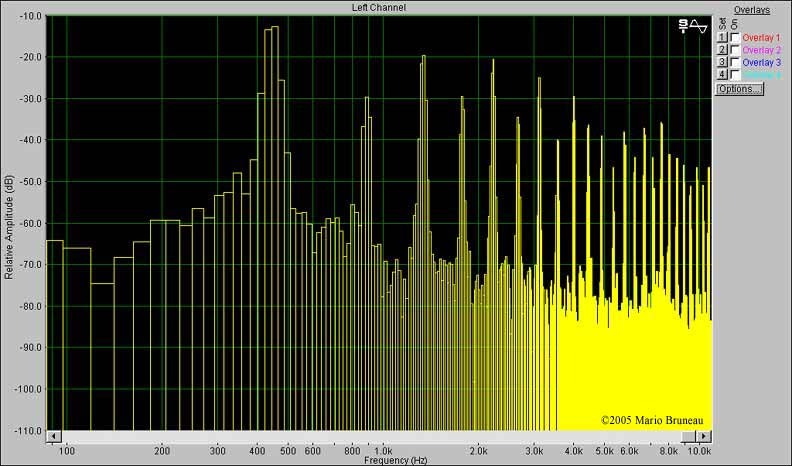 Notice also a more important content of harmonics over 6kHz compare to my Brandoni giving the anonymous its “open sound” quality. 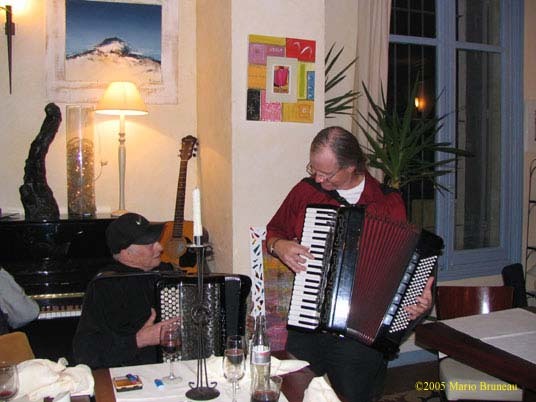 PLAY A WHOLE BUNCH OF ACCORDIONS AND DRINK GOOD WINE! Hope you had as much fun reading my article as I did doing the trip and drinking good wine! 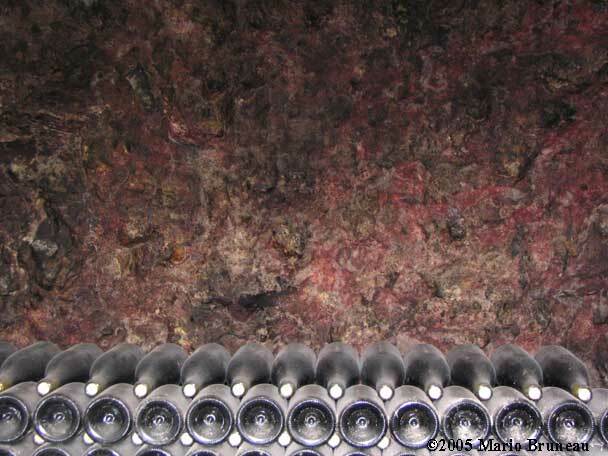 Here is a photo taken at Roland Plou and Sons’ winery in Amboise, France. 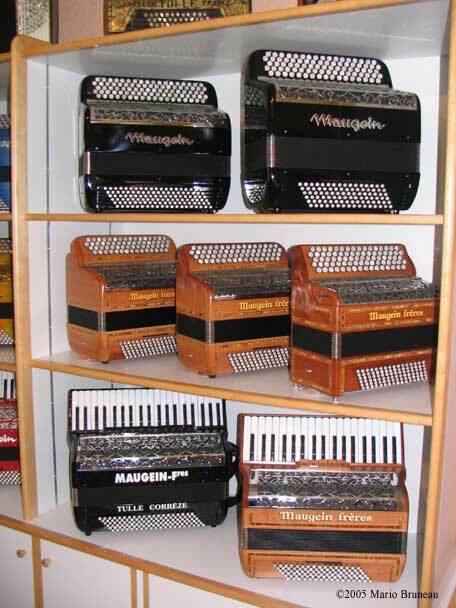 "There are 29 Accordion “Companies/Factories” in the Castlefidardo / Ancona area producing Accordions." Only Excelsior still has a working Kiln. 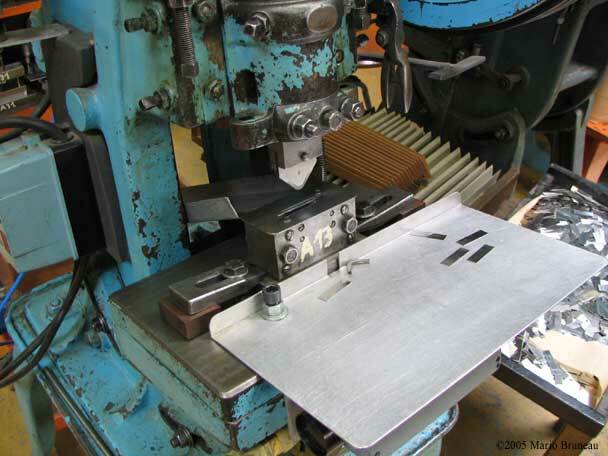 All the other factories are dependant upon one or more outside companies to supply certain critical components, such as buttons, or bass actions assemblies, to them. 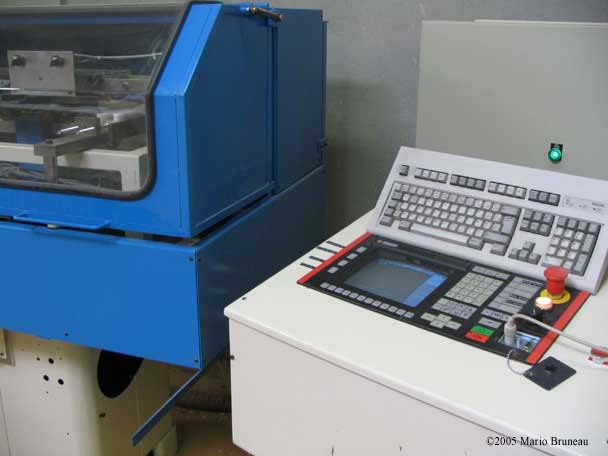 Some companies, like Cintioli, have moved into the specialized production of components/assemblies as their entire business." Well I think Castelfidardo have sort of focused on the right thing, that is: select the best from each component producers and let them have the exclusivity over it. If this fellow produces the best bass mechanism so let it be him who produces all the Italian accordion’s bass mechanism. Maybe things have evolved by themselves to bring the best from each one. I know it sounds unreal but I think some of this phenomenon has occurred over the last 5 years or so in Castelfidardo. 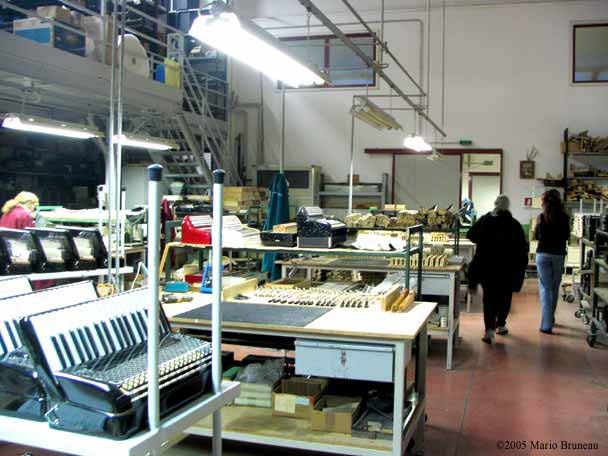 You find truly superior accordions made in Castelfidardo today as the ones produced years ago. This is just a personal feeling but I really felt that way during my short visit. 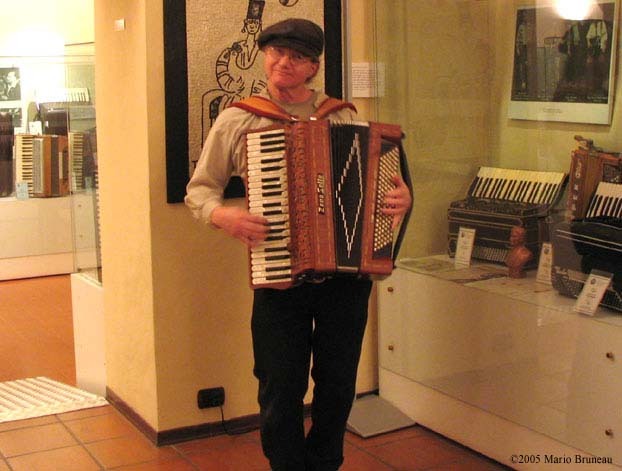 Brandoni-Bompezzo are very good sounding accordions and the Zero-Sette I tried at the museum was marvelous. There is a fellow here in Montreal (Serge Duchesne from Les Accordéons Rosaire Larocque) who imports the Vignoni accordion. Their musette sound is very convincing! I’m telling you, years ago, one couldn’t find Italian made accordions sounding near like they do today. Following several requests, I decided to add more photos of this trip of 2005. 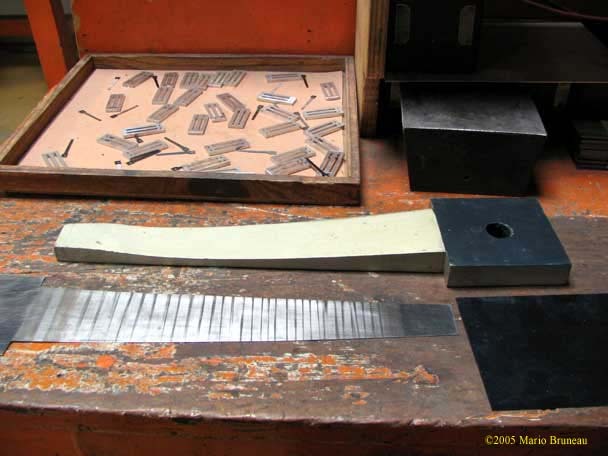 At Cavagnolo, they are starting to get rid of the trimmings for their medium up reedplates. The bond is so tight with the single nail and the two screws that they don’t need the gasket under it. As a result, more harmonic content since the energy is not lost mechanically by the (soft) contact the gasket makes. My mother died a few years ago for stomach cancer. Hi, I was lucky enough to buy a boxed piano accordion at my local charity shop, it is a Castrelfidardo Estrella and red in colour .I am so pleased with it and was wondering how old it might be. I paid £35 pounds for it, case is a bit tatty but the accordion looks lovely. You accordion must be pretty old for I don’t find any pictures of recent accordions on Google bearing the Estrella make. These kind of accordions are very “decorative” because they have a lot of retro decorations. Maybe somebody in your area can tune it a little. Good luck and thanks for passing by my Castelfidardo page. Hello Mario, I would like to buy a petosa accordion from the petosa factory in Castelfidardo, I wonder about all the expenses involved. at the moment for the next two weeks, Im in Pascani Romania. It would not be a major effort to fly to Italy. But I would prefer not to go blind. Thank you. 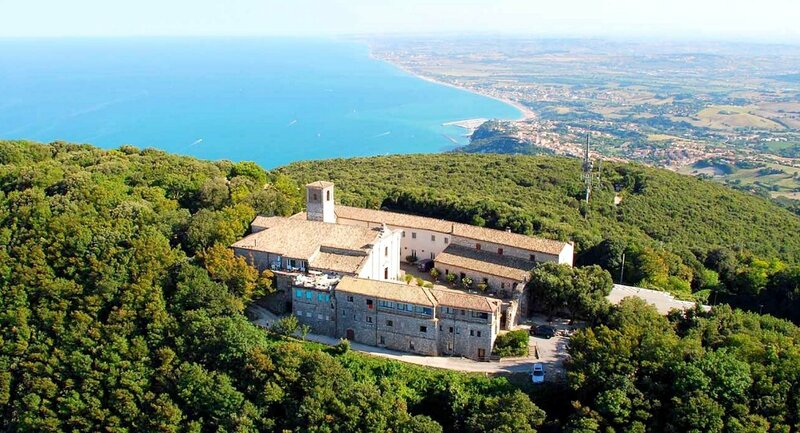 A trip to Castelfidardo is a good idea. 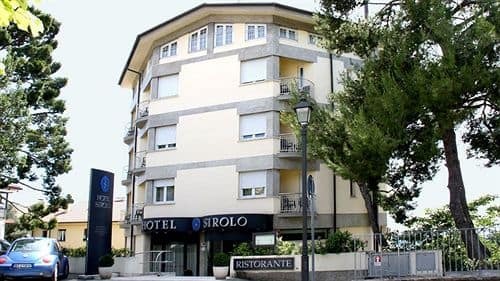 There are cheaper Hotels downtown Castelfidardo but they are not so nice as the ones you’ll find in Sirolo 20Km from Castelfidardo. Sirolo is next to Adriatic Sea and it is so nice there. 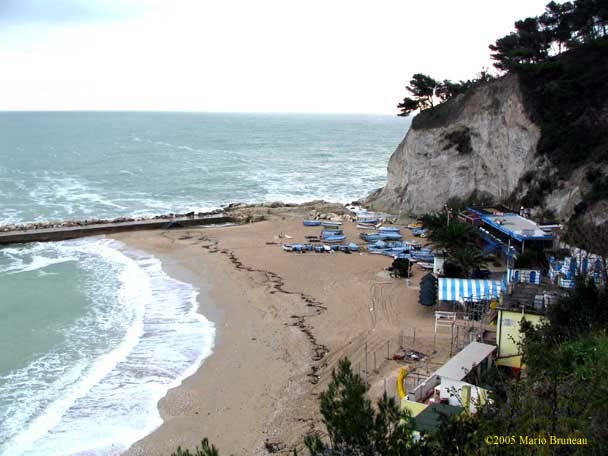 But I think the price differences are not that big compared to hotel in downtown Castelfidardo. Can not guide you with airport since I always go to Castelfidardo driving by car from France. The food is good and should not be too expensive. 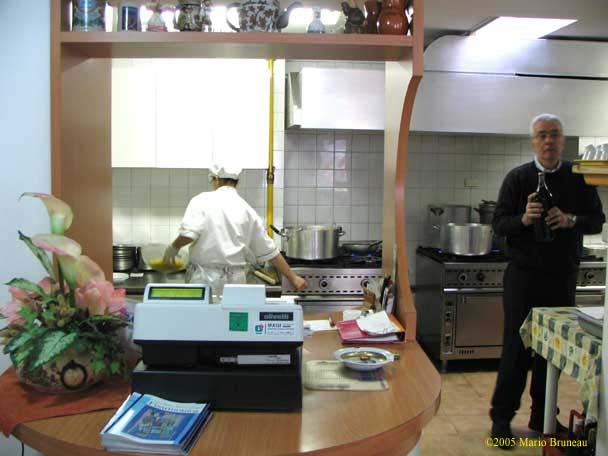 If you have a kind of little kitchen in your hotel room, you can just buy food and take your meals in hotel room to cut expenses. I wish you a good trip to Castelfidardo. I’ve been studying music since I was a child but I’m a beginner when we’re talking about accordion. I’m looking for a better instrument but in Brazil the accordions are very old and expensive and we don’t have any guarantee about the real quality of the instruments, so I can’t effort to buy instruments in a high price. I’d love to buy a real italy accordion, 120 bass, in a fair price, I meaning, I know that I’m a beginner and I don’t need the best instrument ever now, but I’d love to have an instrument almost new, not too old, in tune, in a condition to keep my improvement in playing this beautiful instrument that I’m totally into. Could you tell me if I can buy accordions in both good price and conditions, maybe less than 1.500 euros in Castelfidardo? Could you give me some information about the stores, brands or someone that could help me in this mission? For 1500€ you can get a great used Italian accordion. Also, you did not tell me what type of music you like best? Because there are different types of accordions and each type is more suited to a specific music style. I do a lot of piano evaluations online because I’m a piano tuner and I also teach piano tuning. I charge $67CAD for a piano evaluation. You can send me 3 listings this week and then 2 listings next week and so on up until 10 listings total. I’m trying to find the address of the Guerrini factory. Is it in Castelfidardo? I think Guerrini no longer exist. Be carefull NOT to follow the old domain name guerriniaccordions.it as it contains harmful website redirection. They where based in California and Castelfidardo. Maybe you can try to reach Sonola accordions since this was once Guerrini’s brand. ISSUE-I live in New South Wales Australia-the accordion is with my niece in Essex UK I have not seen the accordion-however I wish to have restored and sent to me. Sorry I can’t help you for I don’t know of any accordion shop in either London or NSW. 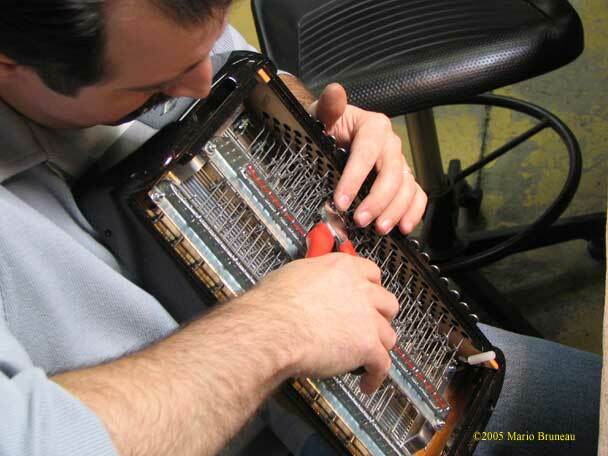 Do a Google search like: “accordion repair London”, “Accordion tuning London”, “accordion tuning New South Wales”, “accordion tuning Australia”, etc. Did you pay attention to the Paolo Soprani diatonics? I’m very interested in their Lutos model, know much about it? Paolo Soprani apart from the name, it is not what it used to be. Nothing compared to the original Paolo Soprani. Just middle of the line quality. The best Diatonics are Castagnari. 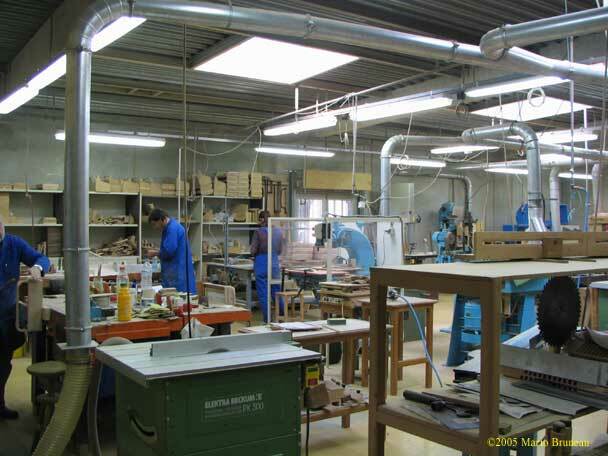 Did you organise your visits to the manufacturers or are most of them open to visitors who come along to their factories/showrooms? No meeting taken in advance. Just drop by and they will help you. Unless you have very specific technical stuff you want to discuss, there will always be somebody to help you. 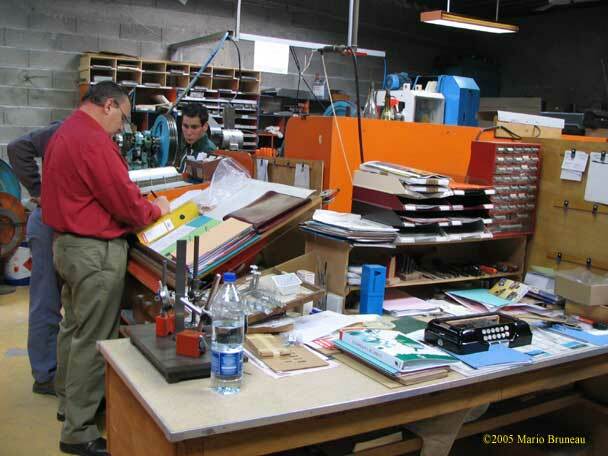 The only thing you need to prepare is some kind of map to plan your manufacturer tour. Hi i have a working accordion made by PASQUALE FICOSECCO IN CASTELFIDARDO. It is a button modal with 8 bass buttons, Could you please tell me anything about this company. Best Regards John Marshall. You have an historic patrimoine in your hands. 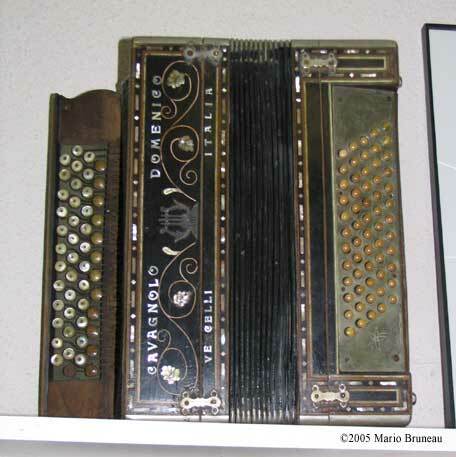 Pasquale Ficosecco was part of the Italian makers that made the accordion what it is today. 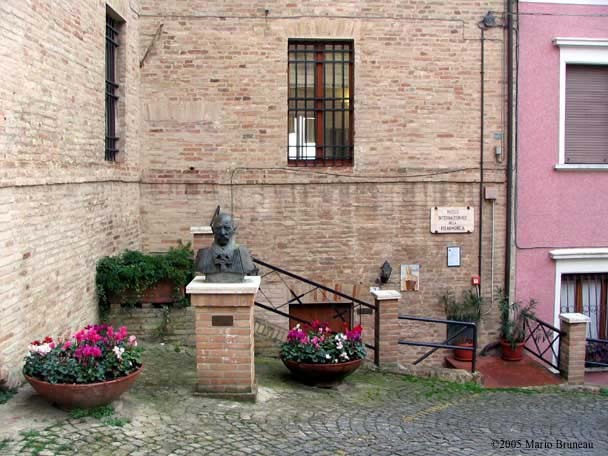 He founded his accordion manufacture in Loreto in 1889 and later moved to Castelfidardo. It’s probably a hand made accordion. It is worth about $700USD. Must have a nice and powerful sound too. I was familiar with Crown Accordions from Chicago was founded in the 1950s by Tony Serbellini (who had previously co-founded Imperial), Geramia Georgietti and Oswaldo Guerrini. 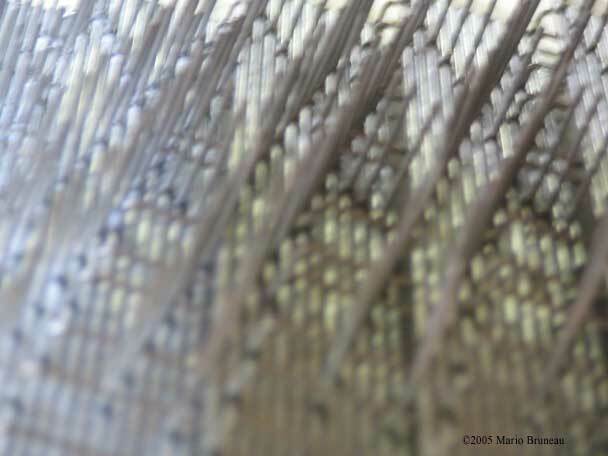 Can you tell me what factory in Italy made the accordions that Crown Sold in the Mid-1960’s? I have two Crown accordions which I prize and would just love to know! Unfortunately, I can’t tell which of the Castelfidardo’s factory made Crown accordions in the 50s and 60s. Can’t you see somewhere on the accordion body a mention like “Made in Castelfidardo” or “Made in Stradella”? A few years ago, I have a friend of mine give me this accordian. Its beautiful for sure. I in turn gave this to my father and he was excited since he plays in church. Since the years take a toll on the human body, my father has decided this is too heavy for him to handle and playes a smaller accordian as well at the piano in his church. I honestly had forgotten about the instrument until this weekend, my father returned this to me. I know nothing about these, since I play guitar and that holds my interest. I would like to know where this instrument came from. It looks more a artwork to me with all the wood work involved. I am honestly more afriad to touch it cause I don’t want to mess it up. You can venture inside the accordion without messing anything if you go easy and take you time to understand how it works by carefully looking. 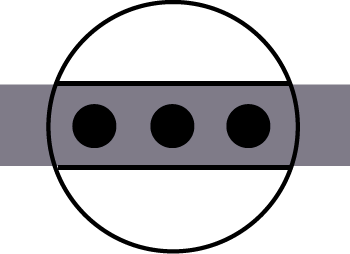 In a near future, I will finish my accordion tuning/repair primer so you will have a good tutorial to start. I have a Brandoni Kingline cassoto, I am seeking information on this instrument. Can you help me with this? The Kingline cassoto from Brandoni a among the top models. A very high quality instrument mostly hand made. Your efforts provide a real benefit to me. I was searching for a new accordion, contemplating various brands, and wondering how, short of travel to Italy, I might make comparisons. Some of the accordion dealers produce videos of their instruments, but the recordings were so poorly produced I could discern nothing of the instrument’s tonal quality. I had liked the look of the Brandoni, but did not like the sound I heard until I discovered your web site. Your recordings encouraged me to give it more consideration. You also introduced me to a French maker, Maugein, of which I had never heard. In fact your voyage to France and Italy inspires me to do something similar one day. So, for all of that information and inspiration it seems a small thing to write to say thank you.